Richard Crowe's Page - Doodle Rescue Collective Inc. Started this discussion. Last reply by Karen and Jackdoodle Feb 9, 2015. Started this discussion. Last reply by Kate Jan 12, 2014. Started this discussion. Last reply by Jacquie Yorke - DRC Director Oct 5, 2013. Started this discussion. Last reply by Nancy, Ned, Clancy, and Charlie Sep 30, 2013. We will assist in doodle rescues in any way we can. Holly, 60 pound F-1 Goldendoodle who was 3-years old on Christmas Day 2010. We also have 4-adult Maltese who are our dogs and usually a myriad of foster Maltese. Right now we have four adult Maltese fosters but, last year we had 17 puppies and 10 adults with us with us at one time. 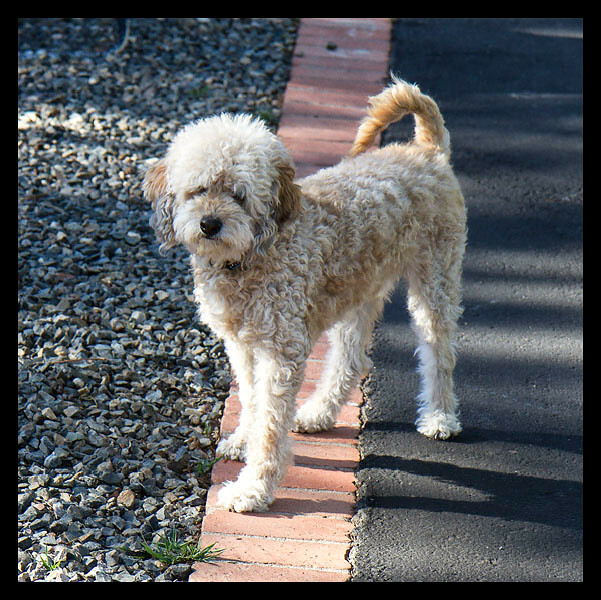 Holly came from a breeder in Texas, Cheyenne Valley Labradoodles and Goldendoodles. We are heavily into Maltese rescue. Other Maltese rescuers know we have a Goldendoodle and we sometimes get queries regarding available rescue Doodles.We also want to get more active in doodle rescue. The niece of Charlie's Arizona Foster Mom traveled to California on Thursday and brought Charlie. I met Charlie in San Bernardino and brought him home. That saved me a trip to Arizona to pick him up and I am very grateful. Please let your friends know about this commercial on the Academy Awards as so many people record shows to avoid the commercials. This little dog, probably Maltese/Terrier mix was rescued from the Devore, California Shelter in San Bernardino. This is definitely a high kill shelter. Hope For Paws has produced a YouTube Video on the rescue of Elmer and Elsie from a scrap metal yard in Compton California. Eldad Haggar and Lisa Arturo rescued these two dogs and Judy and I are fostering them. The video has been viewed over 125,000 times in the two days it has been online. Thanks Richard. We got our Rusty from Cheyenne Valley near Dallas as well. I have been unable to contact Heather, the owner, and wondered if you have her mailing address, as I would like to contact her via mail. We only went to her home once, and I have lost track of the address. I'm unable to reach her by phone. Please let me know if you have her address in Gainesville, Texas. Thanks! P.S. Your pictures of your dogs are adorable! Richard, thank you for the contacts. Hi Richard, Someone in our area (Iowa) is looking to rehome a 4 year old Maltese. Is there a Maltese rescue in Iowa? Richard, I just watched your video of Dandy with his ball & pillow and loved it. It reminded me of my dear old yorkie Cali. She was obsessed with squeaky toys. Cali's favorite thing was to hide them under blankets and attack. Watching Dandy brought back alot of fond memories. Thanks for sharing it.